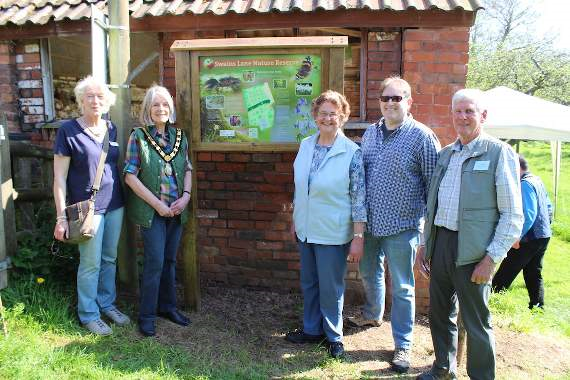 WALL-TO-WALL sunshine and summer temperatures encouraged a sizeable crowd to gather at Swains Lane Nature Reserve on Saturday for the ceremonial unveiling by Vivienne Stock-Williams,mayor of Taunton Deane, of the new information board at the main entrance. He offered particular thanks to Cllr Stock-Williams for her enthusiastic promotion of the scheme from its earliest days, to Wellington in Bloom for its long-standing support and to the team of volunteers who had done so much of the hard work over the years. The crucial participation since the start of 2016 of Blackdown Hills Nature Futures was also gratefully acknowledged. Thanks to its expertise it had been possible to access grants from the Sustainable Development Fund, supplemented by a grant from Taunton Deane Borough Council – represented at the event by Richard Burge, TDBC and West Somerset open spaces manager. Thanks to this funding, the purchase of high-quality information boards became possible, a new ten-year management plan was produced for the reserve, training days arranged for the volunteers and professionally-made labels acquir-ed for the trees in the community orchard. Visitors lingered in the afternoon sunshine, enjoying refreshments and the opportunity to see Great Crested Newts in the pond, as well as to learn more about the Reserve from volunteers.